Standard Bathtub Dimensions: 63"L x 63"W x 21-5/8"H Tub Shape: Double Ended RoundPictured Stone: SandstoneTub Weight: 2600 lbsInterior Finish: Polished Exterior Finish: Polished Material Options: Exterior Finish: Interior Finish: Shape: Tub Exterior Dimensions: Tub Interior Dimensions: Overflow: No Orientation: Freestanding Base: Drain Included: No Faucet Included: No Drain Placement: Custom Tub Weight:This natural stone bathtub is made from sandstone. 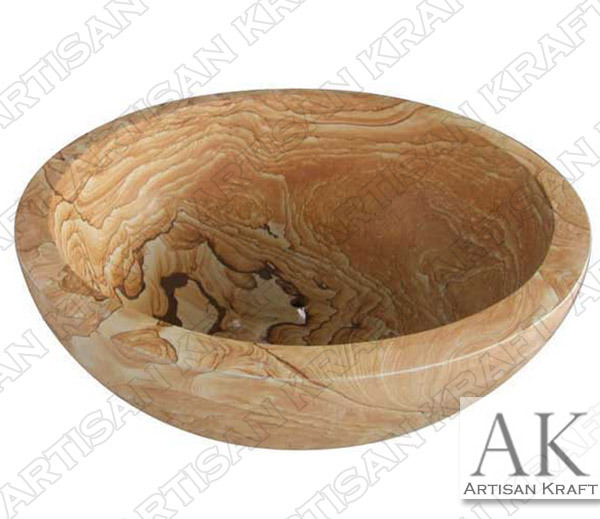 The sandstone has sedimentary layers in the sandstone that give it a distinct look. Every tub will look original. The tub is in a circluar bowl shape. Bathtub carved from stone. Natural stone bathtubs delivered to LA tubs, Washington, and to DC areas all over the USA. Ask us about your custom project specifications at info@akgoods.com or call at 888-652-0106.